Your kitchen is a huge part of your home. Why not upgrade it so that it not only looks beautiful, but also functions exactly how you want it to. 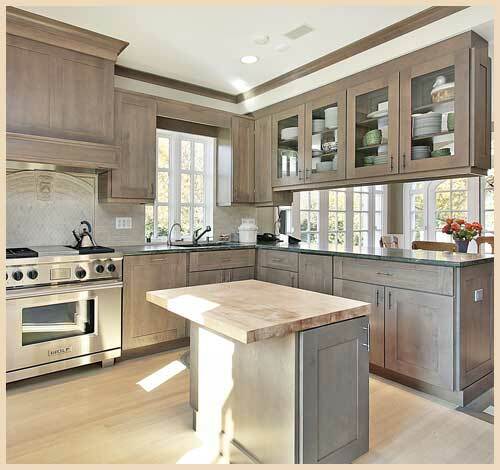 Our experienced craftsman can update or create your dream kitchen with your choice of cabinets. We work with you from the beginning of the process to the end, ensuring that you get exactly what you want from your cabinets. Custom cabinets can sometimes take some time to make. When you cannot wait for custom cabinets or you are just looking for something classic and clean, we can install beautiful pre-fabricated cabinets from WAYPOINT LIVING SPACES >>. Waypoint builds beautiful cabinets for your space’s exact measurements. These cabinets are built to last, so you know that your cabinets are going to last you for years to come. ©2018 RAVEN’S CRAFT. All Rights Reserved. Privacy Notice.